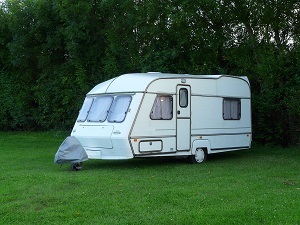 Our caravan storage site in Podington, Northants is set off the main road and is not visible from the road. Our site has automatic gates which are locked every evening, and the inner caravan storage compound has its own secondary gates and barriers which are kept locked at all times. Our site boasts 34 CCTV cameras and Floodlighting. The storage areas themselves are either concrete or grass reinforced with mesh to allow all-weather access to the caravans and it has a perimeter hedge as well as being completely surrounded by a 1.8-metre wide ditch.